What a fabulous creation. All pink and flouncy with the added enjoyment of the marshmallows. My granddaughter would love it, especially the sweets. It caught my eye on the make it Monday blog so I poped over to take a better look. 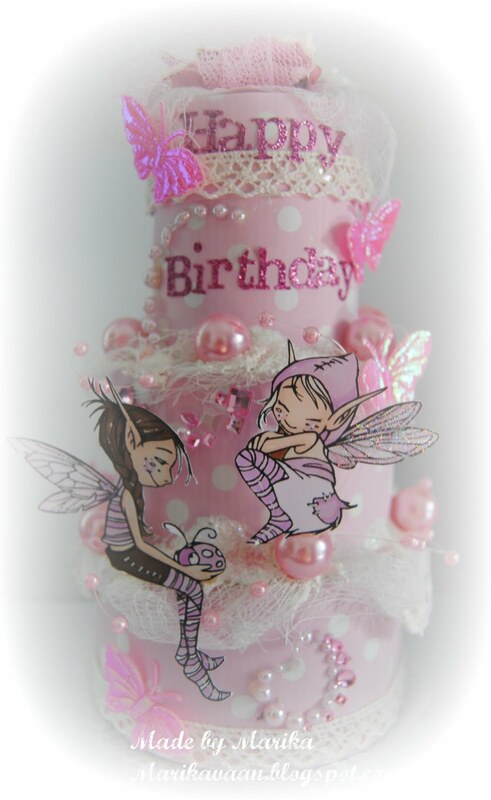 Love the pink colours and the fairies looks adorable! This is super cute and girly :D Can I steal some of those marsh mallows? Thank you for joining us at Marianne's Design Divas first challenge and good luck. Hi Marika, A beautiful creation, stunning work my dear. Thank you for joining in with our very first challenge over at Marianne's Design Divas. Good luck in the draw. Stunning Marika! I saw this on MIM and just had to come and take a better look. Amazing! I love every part of it. It looks like the fairies are going to fly right off!